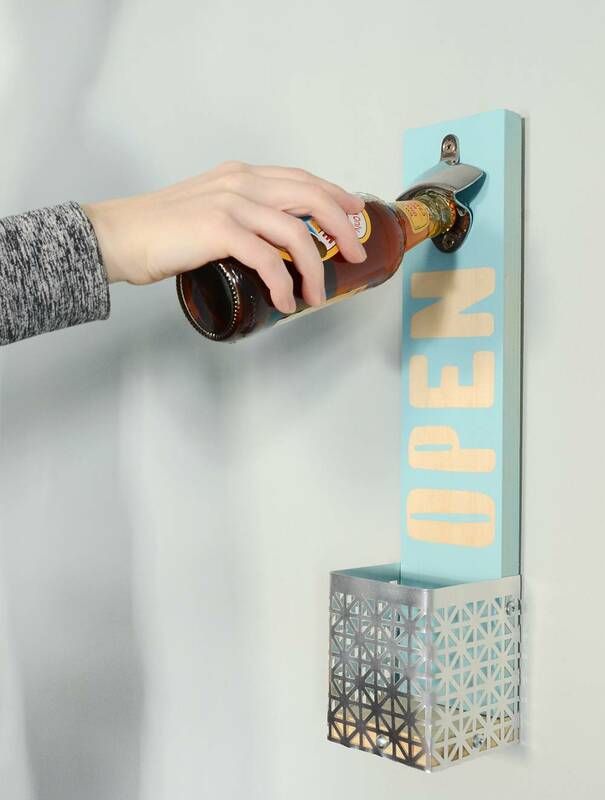 Add some serious character to your bar area with this easy DIY wall mounted bottle opener! It won't take long to make, and it's sure to elicit all kinds of oohs and aahs from your friends. Click through to check out the full photo tutorial. It's colorful, it's unique and best of all... it's incredibly easy to make. 2 pieces of wood, size 16" x 3.5" and 3.5" x 3.5"
Radiator covering, size 10.5" x 4.5"
Begin by drawing out the word "open" on an 8" x 3.25" piece of the shipping label paper. Alternatively, you could print out the word using your favorite font. Carefully cut out the letters and set them aside for now. Use the tin snips to cut the radiator cover sheet to 10.5" x 4.5". Sand your wood now, if it has any rough edges. Place the bottom left corner on the edge of the smaller piece of wood and insert a screw through one of the holes and into the wood. The head of the screw should be large enough so that the radiator sheet doesn't slip off. Gently bend the radiator sheet at the corner of the wood, wrapping it all the way around. It should cover three sides perfectly (see photo below). Insert screws into the other sides in the same manner. Lay everything out in front of you as shown above so you can place the letters in the right spot. Peel the adhesive backing off of each letter and stick them to the wood. Take the large piece outside and spray paint it using a few thin coats of paint. My favorite spray paint is called Montana Gold, available here. Put a small line of wood glue along the back top edge of the smaller piece of wood... this will be where the larger piece attaches. Once you've attached the two pieces, drill a screw into the top section of the radiator sheet on the side of the wood. Do the same on the opposite edge. Now screw the bottle opener onto the top of the large piece of wood. Last, create a hanger on the back by wrapping a small piece of wire around a screw and inserting the screw into the top left of the back of the wood. Do the same on the top right. If you have a permanent spot for it, I would recommend using a long 2" screw (instead of the one provided with the bottle opener) in the top hole of the opener and screwing it right into the wall. It will be sturdier that way. There's no need for the wire hanger in that case. And you're all finished! Nobody will have to ask where the bottle opener is anymore, and you won't have bottle caps floating all around the house either because the little basket will catch them. The radiator cover sheets come in different finishes, so you could definitely experiment with the color scheme... a copper basket paired with a turquoise spray paint would look great. Feel free to take this general idea and make a wall mounted bottle opener that's perfect for your home! Maybe you add your favorite sports team's colors, or stencil the names of your family members on it instead! The combination of the adhesive letters and the high quality Montana Gold spray paint makes for super clean lettering. If you are considering mounting one ouside like I am, I would definitely recommend applying a sealant to protect it during inclement weather. It will last much longer that way. Or you can mount it right above your bar cart. Or both! Happy crafting everyone.